Gallace's paintings, for all their summer breeze and panache, are cagey, closeted, revealing little about their ostensible subject, homes, perhaps nostalgia. The paintings filter through a haze despite their seemingly intense observation; the buildings bear the indistinctness of memories even if the light and setting do not. Whereas generally depictions of homes emphasize facade, surface details, Gallace is at pains to scrub the walls into blank surfaces, vague windows, emphasizing the box, accentuating volume, alluding to the space inside, the subjects we can't see. 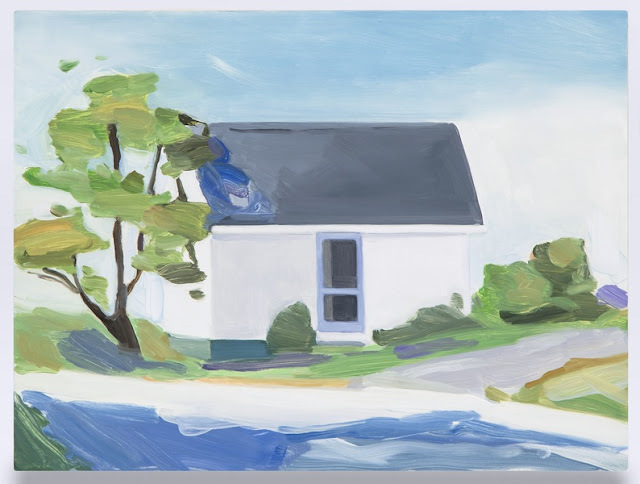 The house is a metaphor for painting: a container that reveals nothing about its interior, the subject; Gallace's only paintings of with interiors appear to also be self-portraits.